AN AUSTRALIA Post courier has been caught on CCTV in a bizarre delivery fail resembling something out of a slapstick comedy. 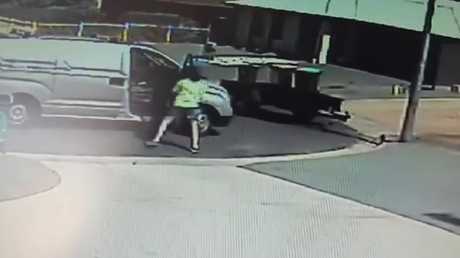 Video of the incident, which occurred in Dubbo about 3pm on Thursday, was posted to the Australia Post Complaints Facebook page by Geoff Crowe. "Australia Post, please explain," he wrote. The video shows the woman delivering something before walking back down the driveway towards a grey van, which is parked in the cul-de-sac with a black trailer directly in front of it. "She's going to run into it isn't she?" he narrates as she walks towards the door. Sure enough, as she tries to turn away the van clips the trailer, knocking it sideways and causing it to roll down the street. The woman jumps out of her van as it's still rolling backwards to retrieve the trailer. She grabs the trailer and starts dragging it back, just as the van stops and begins rolling back towards her. "Her f****** car's rolling," Mr Crowe says. The van mounts the kerb, narrowly missing the woman and the light pole. She hops back into the van and reverses off the kerb before driving off, leaving the trailer blocking the neighbour's driveway. "Just got in the car and left it there," he says. One user on Facebook described it as a "comedy of errors", while another likened it to a scene from the 1980s comedy series The Gods Must Be Crazy. "Where do they find these bloody idiots!" another said. One pointed out that "at least they delivered the package". Some debated whether the owner of the trailer was at fault. "Trailer should not have been parked there anyway," one person said. "On a cul-de-sac it should be on the grass or off the road. I can't even recall ever seeing a trailer that's not connected to a vehicle on a road at all." Another person responded, "In NSW if it's registered then it is legally allowed to be there. Every street has some sort of trailer parked in it, it's just as common as a jar of Vegemite in the cupboard." Australia Post told news.com.au it was investigating the incident.